Parquet is a beautiful and durable finishing material that perfectly retains heat indoors and gives a pleasant tactile sensation, allowing you to achieve a cozy and comfortable stay in the house. Laying parquet on the screed. Many people think that laying a parquet on their own is almost impossible. However, in reality this is far from the case. Although when working with parquet, certain skills are required, but if there is a desire, installation work will be possible for everyone. Therefore, further will be considered how to put parquet with your own hands. 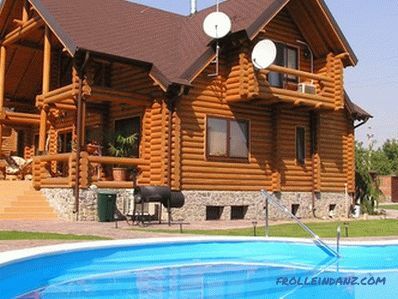 It is worth noting that wood is very sensitive to the external environment. Before you put parquet, you need to take into account the temperature and humidity conditions in the room. The air temperature during installation should be in the range of 18-24 ° C, and humidity - 40-60%. It is recommended to adhere to the same parameters when using the parquet. 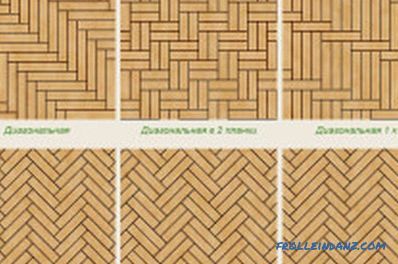 Types of herringbone parquet laying. Linear. 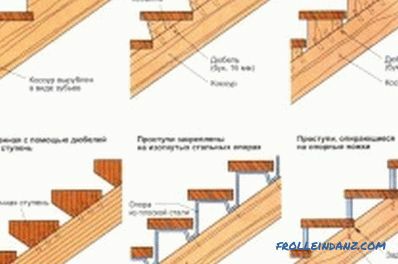 It is the easiest way to install, in which the parquet is parallel rows. At the same time for large rooms it is recommended that the panels be directed to the windows. If the room is narrow and long, then for its visual increase the boards need to be laid horizontally. Swedish square. This scheme is used when laying lacquered oak parquet, which is mounted in the form of rectangles perpendicular to each other. In one such element may be 2-4 boards. The Swedish square looks great in small rectangular rooms. Curb. In this case, the panels are mounted perpendicular to the walls and the main installation. Typically, this method is used for facing the floor in large square rooms. Herringbone. It involves the placement of rows of boards at a certain angle to each other. The result is a pattern resembling the branches of a Christmas tree. Deck. This method of laying is by far the most popular. Compared to the herringbone, it is simpler, but the resulting coating cannot boast stability to temperature differences. 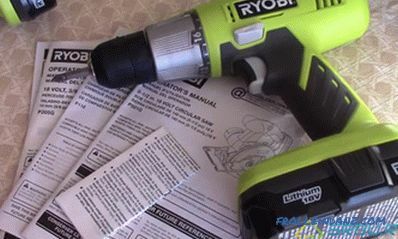 When installing the boards are shifted by 1/3 or 1/2. 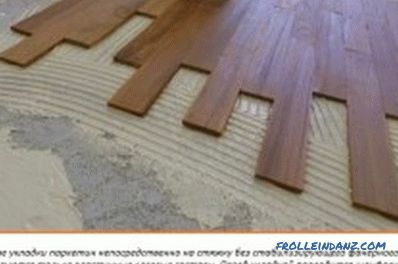 Before laying the parquet, it is necessary to properly prepare the room and the foundation. First of all, all the furniture is taken out of the room and the old floor is dismantled down to the concrete base, after which it is thoroughly cleaned of debris and dust. If there are cracks, chips or other defects on the base, then they should be level with a putty. Concrete protrusions and ridges should be cut with an improvised tool. If the base has large irregularities (more than 20 mm), then you will need to fill in the cement screed. To do this, you can use a self-leveling mixture or make a solution yourself. The mixture is poured over pre-installed beacons, the evenness of which is measured by the building level. After leveling the surface it should be left alone until completely dry (about 25-30 days). After that, it is necessary to measure the humidity of the substrate. To do this, a piece of plastic film is glued to it on the selected area. If condensate is detected under the film after a few days, then such a surface is not ready for finishing. If the area under the film is dry, you can proceed to further work. 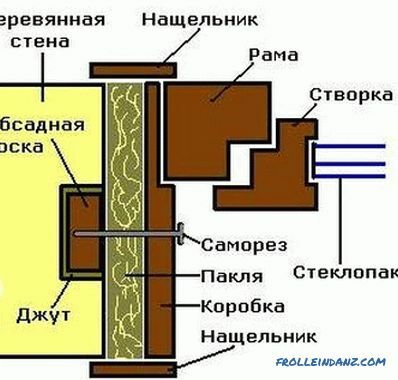 Device for parquet on screed without plywood. Next, the screed lends itself to a primer, after drying of which a waterproofing material is mounted. As it can be used polyethylene, vapor barrier film and roofing material. After a layer of waterproofing fit lining material, in which you can use moisture-resistant plywood with a thickness of at least 12 mm. Each sheet is cut into 4 parts, which allows for a better fit of the material to the base. After that, a glue compound is applied to the floor with a notched trowel, over which the plywood is placed. 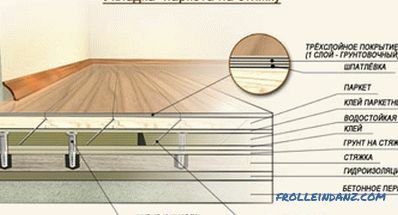 At the same time between adjacent sheets should be small gaps (expansion joints) with a width of 0.5 mm. Near the wall, the gaps should be somewhat wider - about 1.5 mm. For better fixation, each sheet is additionally secured with self-tapping screws.After the glue dries, the joints of the sheets are carefully sanded to align them. The substrate is free from dust and primed for better adhesion. 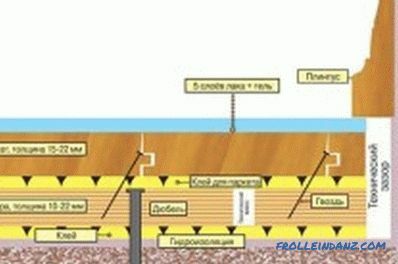 When the base is fully prepared, you can proceed directly to the installation work. In order to properly put the parquet, it is recommended to start laying it from the corner of the room, gradually creating the main diagonal. The seams between the individual elements should be scrambled, although it all depends on the method of laying. To lay the parquet firmly on the base, the back side of the facing material is treated with mastic or glue, and on top of the plank it is additionally fixed with furniture brackets or studs. 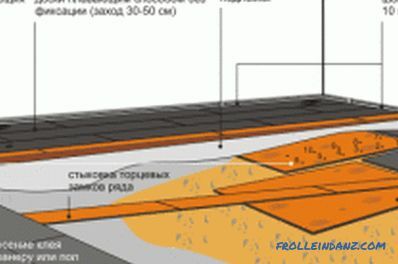 In the first 2 rows, full-sized elements are used, after which the trimmed parts are laid against the walls. This allows you to make the lining more accurate and attractive. The subsequent rows should be started from the wall using scoring boards. This will create a chess order of the seams. Each subsequent row with a hammer and chisel leads to the previous one. Once the entire parquet has been laid, it must be carefully polished. Primary polishing is performed with a drum type drum machine. 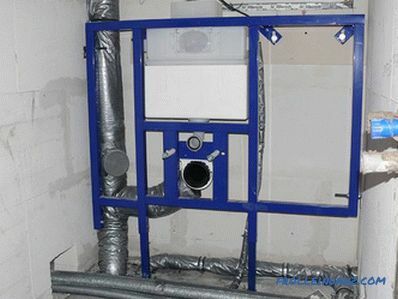 Its main goal - the removal of large irregularities that have arisen after the installation work. 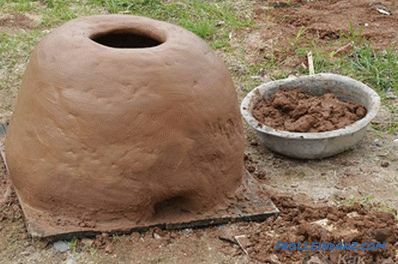 Begin grinding with coarse grinding cloth, gradually moving to a smaller one. The number of passes by the grinder will directly depend on the degree of unevenness of the web. Before the last pass, putty is made, with which all joints and minor defects are filled. Final grinding is carried out using a surface grinder. Then the parquet is treated with a primer mixture, after drying of which you can proceed to varnishing. The varnish is applied in several layers. After applying the next layer, you must wait until the previous one is completely dry. Having understood how to put parquet, you can create a truly beautiful floor covering that will last you for many years. Looking at the beautiful floor, made with your own hands, you will surely feel the deep satisfaction that only high-quality work can bring.